LWB is the abbreviation used by tarotists for the "little white book" containing card meanings and divination methods that frequently accompanies tarot decks. The LWB enclosed with the modern Grimaud Grand Etteilla deck only links the first 12 cards of the deck with the zodiacal signs; this accords with what can be found described in Etteilla's "Fourth Cahier". Here on pages 17/18 Etteilla instructs the reader to inscribe the first 12 cards of his deck with the signs of the Zodiac; he links these with the parts of the body they were thought to rule by astrologers: Aries the head, Taurus the neck and shoulders, Twins the arms from the shoulders to the fists, etc. The Grimaud LWB also states that in actuality these astrological correspondences play no part in the "jeu", for they aren't relevant to cartomancy but to astrology, and they shouldn't play a part in our interpretations, but are only given for the sake of documentation! However, on page 22 of the Cahier I notice Etteilla instructs the reader as follows: "Ayant du tracer, comme je vous temoigne, les douze signes ou caracteres des signes du Zodiaque, sur vos douze premiers feuillets, if faut a present marquer les caracteres des sept Planettes, & les trois caracteres des noeuds ascendans & descendans de la Lune, & partie de fortune sur vos dix hyerogliphes des deniers, vous reportant sur le supplement au troisieme Cahier, pages 95 & 96"
Thanks, all. I wasn't familiar with the 2nd thread that Bernice located, the one where Cerulean posts the "Julia Orsini" translations. I will study them and compare them to my "Julia Orsini." Kenji. Thanks for the reference to book 3 of the "cahiers" and its connection to the Editions Dusserre booklet. Wow, all these people with the "cahiers" in front of them, a book virtually absent from libraries, or at least per WorldCat! As for your later discussion, Kenji, how do you know which version of card 35 comes from which source? According to Revak, Papus gave his reference as the "Dictionnaire," and Papus had "Naissance" as upright and "Chute" asreversed. Or did he misquote the "Dictionnaire" so as to correct its error? And how do you know what D'Odoucet wrote? Do you have his book, too? If not, could the change to "Chute" upright and "Naissance" reversed have started with "Orsini" in the 212 page book of c. 1838? Ptah: thanks very much. That's exactly what I wanted to know. I have a reprint of the 1st and 2nd "cahiers" by Editions Jobert (1977). The 3rd's photocopy I have is what I ordered from British Library. And the 4th is contained in Jacques Halbronn's book (1993), as you may know. Unfortunately I don't have direct access to either of D'Odoucet or "Dictionnaire" (except the 1st volume of D'Odoucet's "Science des signes", which is included in Elie Alta's "LE TAROT EGYPTIENNE"). So this is my guess. "Chapter VI is entitled 'Detailed Study of the Divinatory Meanings of the 78 lames as given by Etteilla and d'Odoucet'; it copies the table of meanings found in the Dictionnaire synonimique,...."
"Pour aider les travaux des veritable chercheurs nous avons resume en ce chapitre VI les travaux les plus ardus d'Etteilla et de son disciple d'Odoucet." So Papus does mention Etteilla and D'Odoucet. But meanwhile, I can't find the words "Dictionnaire synonimique" anywhere in this book. (I may have missed it. Can anyone?) Here, "Etteilla" should mean the 3rd "cahier" in Papus' private collection, which is introduced here and there in this book. Not "Dictionnaire". And as WPC itself admits, there are a few differences between "D'Odoucet" and "Dictionnaire synonimique". They are not completely identical. Now have a look at the LWB of Editions Dusserre's GRAND ETTEILLA by Mr Jean-Marie Lhote. It says he "chose" three sources as "Origine des textes". They are Etteilla's "cahiers", D'Odoucet's "Science des signes", and "Dictionnaire synonimique". And see the pages 39 - 73. This section is titled "TABLE DES SYNONYMES DU LIVRE DE THOT SUIVANT L'ORDRE DES FEUILLETS", which is virtually identical to the name above Decker et al mentioned. The 1st "FEUILLE" is "Etteilla ou le Questionnant" (not "Consultant"), and No. 0 "Folie" is put between the 21st and the 22nd, not at the last. And in addition, the synonym for the uprighted 35th feuillet is "Chute". 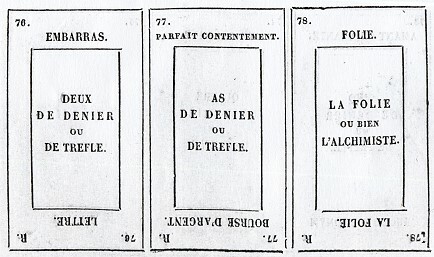 On the other hand, in the chapter VI of Papus' "Le Tarot divinatoire", the 1st lame is given the synonym "LE CONSULTANT", and the lame "FOLIE" is placed as the 78th. And unlike the table above, he gave the 35th lame "NAISSANCE" when uprighted. Yes, I see your reasoning. Very good. Since Papus refers to "Etteilla and his disciple D'Odoucet," and doesn't mention the Dictionnaire Synonymique he is relying on D'Odoucet as the interpreter of Etteilla. So Papus uses "consultant" rather than than "questionnant", and has the 35th card with "naissance" upright. The Dictionnaire must have used "questionnant" and had "chute" upright, because that's the way they appear in the LWB. The material from the works of Paul Christian appears on the left hand page, followed by the interpretations of Etteilla and d'Odoucet. However only two sets of interpretations actually appear, one in italics from Christian and the other, the synonyms, attributed to "Atteilla." Thus the translator seems to be saying that the "Etteilla" list is the same as the "D'Odoucet." You must also be right that Revak was relying on Decker et al, and thus repeating their error. Thank you. The actual cards of 1789 (in Decker et al) use "questionnant" and have "naissance" upright! So both the "Dictionnaire" and D'Odoucet seem to have departed from Etteilla, while also each keeping a different bit of him. I am now reading Cerulean's translations from the Editions Dusserre booklet alongside the c. 1838 Las Vegas book. Cerulean's is an abridged version of one section of the c. 1838, its "Explication des 78 tarots ou cartes Egyptiennes Formant le Livre de Thot," pp. 51-152 of the c. 1838 book. The abridgement is clearly made by an editor with not much sense and a lot of red ink. For one thing, he or she removes all reference to the method of doing spreads that precedes this section of the book, a very particular method that I have not seen before. He also appears to change the wording often, from what is fairly clear to what is fairly obscure. And he omits a lot. However not to prejudge this editor, I have ordered a copy of the "Grand jeu de dames" deck myself, in hopes that the booklet in question, c. 1850, will be included, in its French and English versions. "Bair's Lair" was out of stock, so I had to spend a lot more ($35 including postage) at another internet source. Before I comment on the two “Julia Orsini” texts in detail, I hope I will be able to see the c. 1850 for myself. Since publishers list decks rather than booklets, which decks by which publishers have the LWB? That way I can shop around and get the cheapest. If the cheapest way is to buy the booklet separately, I am happy to do that. Before commenting on the c. 1850 “Julia Orsini” booklet (in a future post, not this one! ), I want to ask a few more questions about the 1789 cards as reproduced in Decker et al. I want to ask something about the little writing in script that appears at the top of some of the cards. Some of this writing also appears on the tarot.com “Etteilla” cards. But some of it (on cards 14, 15, and 17) doesn’t appear on later decks, that I can find. Card 5 has “4. Cre.” In other words, “Fourth day of Creation.” No associated element. Cards 6 and 7 are missing from Decker et al’s reproductions. Card 8 has some writing on the left side. Perhaps it reads “A. P. D. R.” With two dots above and to the right of the A. Or perhaps it is just “P. D. R,” with some other symbol to the left of it, containing at least 2 dots. Card 15 has a small number on the top right. I can’t quite make it out. It is either “16” or “1e.” “16” would be the Marseille Maison-Dieu, which doesn’t correlate with Decker et al’s table. “1e” would be the Bateleur, which does correlate. Card 17 has a small “13” in the top right. There is also a “13” in the lower left. These would mean that the card correlates to card 13 of the Marseille, as is fairly obvious. I see no more little writings on Decker et al’s cards; but then 18 and 19 aren’t shown. The c. 1838 “Julia Orsini” book amplifies on this writing, even though its reproduction of the actual cards doesn’t have any of it. Here are pp. 13-15. The diagrams here for cards 1 through 9 are self-explanatory. I find this way of seeing the initial trumps as significant, in that I have for some time seen the seven days of creation already in the Marseille cards, as hidden meanings of the first seven cards, Bateleur to Chariot, existing as such since Italy of about the end of the 15th century, as well as in the first seven cards of each of the four suits. How I get these to these hidden meanings is not by recourse to intuition (or spirit-guides or extra-terrestrials), but through the use of the 4th century Neopythagorean text Theology of Arithmetic--which I have verified did circulate in manuscript in Venice and Florence of the late 15th century and was came out in a print edition in mid-16th century Paris (as can be seen on WorldCat). I see that text's thinking and imagery in the first seven cards in each suit of the 1491 Sola-Busca, and then much the same imagery in the “synonymes” section attributed to Atteilla by Papus, and also in the first seven Marseille trumps. I also see some of the same thinking and imagery in Philo of Alexandria's Neopythagorean account of the seven days of creation in his essay “On the Creation." I would not want to explain my whole theory here, which I have elaborated elsewhere, but I could probably say in not too many words how the first seven Marseille trumps reflect the seven days of creation, in terms, like Philo's, both Biblical and Neopythagorean. But I won't do it now. I am not alone in seeing Neopythagoreanism in the Marseille trumps. Jodorowsky describes it in his book Way of the Tarot, but in an intuitive way, not appealing to any sources available during the formative stages of the deck. I think he is not merely using his own intuition, but also drawing on esoteric tradition, because similar analysis is in Zain’s writings on the cards. The question now is, when did that tradition originate? I hypothesize that Etteilla, in identifying the early cards with the days of creation, is merely making explicit what was already an esoteric understanding of the first seven cards of the trumps and each suit, going back to the end of the 15th century, not only in the Sola-Busca but probably also the Cary Sheet and Giulia Orsini. (I have discussed elsewhere how the Cary Sheet is associated with Alexander VI’s Egyptomania via the painter Pinturicchio and Ascanio Sforza; my argument is the expansion of a point in O’Neill’s essay on the Popess. Huck’s comments on Giulia Orsini very much help my case. She might be named as author in the same way in which philosophical writing indebted to Aristotle was attributed to Aristotle, and alchemical writing influenced by Raymond Lull--who was no alchemist--was attributed to Raymond Lull.) In this way the notations on the top of the cards referring to the Days of Creation might reflect a pre-existing tradition which Etteilla made explicit, although in a garbled way, one going back not to Egypt, or even the beginning of the tarot, but to the time of Giulia Orsini. So my question now is, where does Etteilla himself, or his immediate disciples, write about the seven days of creation? I want to know more about his rationale for putting them in the tarot. All I know, from Payne-Towler (http://aolsvc.womens.tarot.aol.com/a...inental?format), is that Etteilla was supposedly not using Genesis, but the Poimandres, a Hermetic text. Looking at that text (Barnstone trans. The Other Bible, p. 570f), I find the four elements, to be sure, at the beginning of creation (a move inspired by Plato's Timaeus), and the creation of "mere matter" below. I see Biblical-sounding wording (in Roman Alexandria, such language is no surprise) about the creation of "winged creatures and water fish, and "four footed things and creeping things," and finally the Father bringing forth "a being like himself." I also find seven celestial Rulers (i.e. the planets) giving rise to seven human beings. But I see no seven days of creation. (No mention of plants or stars either, but that is a small point.) Etteilla is perhaps making an imaginative leap; but in what terms? Most of the ingredients are there, except for the seven days. Is there more? Where is Etteilla's discussion? I would guess that if it is anywhere, it would be in his Hermetic and alchemical treatise called “Les sept nuances de l'oeuvre philosophique-hermétique; suivies d'un traité sur la perfection des métaux,” also known as “Science. Leçons théoriques et pratiques du livre de Thot.” Does anyone have access to that text, or relevant quotes or paraphrases from it? On WorldCat, the only libraries shown are the British Library, the Bibliotheque Nationale, and the Zentralbibliothek of Zurich. I am sure none of them will lend it to me. Are any of these holdings available on-line? I tried the Bibliotheque Nationale without success. Is it discussed elsewhere? Finally, here is the diagram for c. 1838’s card 78, whch is in the same row with 76-77. I have seen this title translated as “Folly of the Alchemist.” According to this text, it is literally “Folly, or Indeed the Alchemist.” We must bear in mind that Etteilla was himself an alchemical writer, publishing his “Seven Nuances” very close in time to his “cahiers” and the 1789 deck. The alchemists traditionally derided themselves for their folly, spending so much for so little in return (as do we all!). It is probably said with some irony, since they also claim to have received thereby the favors of Lady Wisdom. (1) How can I get a copy of the LWB most most cheaply and surely? (2) Where do Etteilla or his disciples write about the seven days of creation and/or the Poimandres? (3) Does anyone have access to Etteilla’s “sept nuances” or paraphrases therefrom? Since my last post, I have received my copy of the “Grand Jeu des Dames” deck and, --more importantly, the 112 page booklet that comes with it, 56 pp. in French attributed to Julia Orsini, and 56 for the English translation, These concern the “Etteilla II” decks; so for now I will say no more about “Julia Orsini” and her books. I still want to focus on Etteilla I. 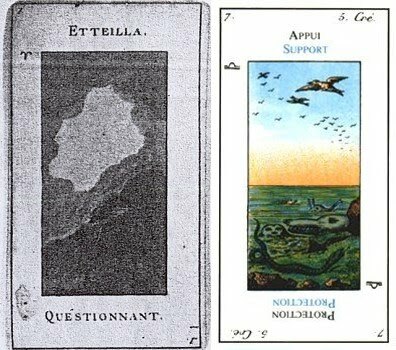 On the 1789 “Etteilla I” cards as depicted in Decker et al, I have two additions to my previous post. First, Decker et al say that it is definitely the number “16” that is written on card 15 (p. 93). They also say that the number “17” appears on card 16, which is one they don’t give a picture of. So all the cards 13-17 have such numbers. They are explained by the Dictionnaire of 1791 as “signes du mort” (“signs of death”), according to Decker et al. But what does that mean? My theory is that these numbers represent the corresponding Marseille cards. If so, we have Temperance, the Devil, the Tower, the Star, and Death. If the Marseille Temperance represents the Eucharist, as some say, it is a sign of death and rebirth. An 1826 Etteilla I Temperance card (which I will discuss next) has "Angel of the Apocalypse" written on it (Kaplan vol. 2 p. 401, with a picture on p. 400): another way of seeing the Marseille card, and a clear sign of death. As for the Marseille Star, that could be the "bright and morning" star of the Apocalypse, too--and again, perhaps, the Eucharist. The others are self-explanatory. [Not only are these cards "signs of death," but each has a particular association with the picture and keywords on the corresponding Etteilla card, I think. Temperance, 14, is associated with marriage, Etteilla's 13, in that marriage should be founded on that virtue, moderation in all things. It also requires the Eucharist in the ceremony depicted on the card, as marriage is a sacrament. The association of "major force" and the devilish personages on Ettteilla card 14 to the Marseille Devil card is obvious. It depicts what happens to those who do not receive God's grace after death. It is the major force opposing God. The Etteilla card also has other meanings, relating to energy in general. The list of synonyms in the c. 1838 book includes "spiritual force" as well as acts of violence. But in relation to death, it is its relation to the Devil that most matters. The role of the Magician on Etteilla card 15 still remains to be explained. The 1826 Etteilla I deck (which I will discuss next), I think supplies the link. The word "Aaron" is written on card 15 (Kaplan vol. 2 p. 401, picture p. 400). The Magician is the Priest who is a conduit for God's grace and punishment. For Etteilla's 16, Judgment, the association to the Marseille 17, Star, might be that both have to do, in one interpretation of the cards, to the Apocalypse, as I have already discussed. That is when the Last Judgment happens, and it is announced by the "bright and morning star," Christ, offering his body and blood one more time. 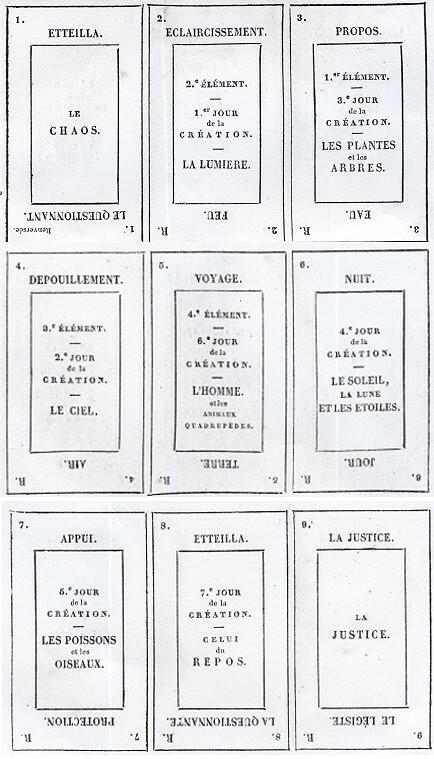 My second addition is that Decker et al hypothesize that Etteilla’s “seven days of creation” theme for cards 2-8 is “an adaptation of an idea of the comte de Mellet” (p. 93). Indeed, he does seem to be following de Mellet, who reverses the Marseille order and has the cards from World to Devil come first, describing events in Genesis 1 and 2. De Mellet’s World is the “the Universe with the Goddess Isis in an oval, or an egg, with the four seasons at the four corners”; then the Marseille Judgment becomes “Creation of Man,” Sun becomes “Creation of the Sun”; Moon becomes “Creation of the Moon and the Terrestrial Animals,” Star becomes “Creation of Stars and Fish,” the House of God becomes the expulsion from Paradise, and finally “the Devil or Typhon, last Card of the first Series, come to disturb the innocence of the man & to finish the golden age” (all from http://www.tarotpedia.com/wiki/Reche...sur_les_Tarots). Etteilla does seem to be using some of these ideas. Decker et al observe that Etteilla is similar to de Mellet in other ways, too: in his correspondences between the ordinary French card suits (diamonds, hearts, spades, clubs) and the tarot suits (batons, cups, swords, and coins, respectively), and in his general characterizations of the suits. De Mellet had identified Hearts/Cups with happiness, Clubs/ Coins with Fortune, Spades/Swords for misfortune, and Diamonds/Batons for indifference and the country. For Etteilla, “Cups have to do with success and victory, i.e. happiness, Batons have a card labeled “country”; Coins are full of money and joy; Swords are clearly turned to misfortune” (Decker et al p. 94). And this is just for the pips; the court cards, I would add, reflect similar themes, with the King and Queen of Batons as man and woman of the country, Cups as man and woman of rank or high office (i.e. success), and Swords as the law and widowhood (the fate of soldiers’ wives). Coins, as “vicious man” and “bad illness,” do not fit this pattern. It is not necessarily that Etteilla followed de Mellet: these same general characterizations also apply to Atteilla's earlier suit asignments to the Piquet deck in 1770, as Decker et al point out. However seeing de Mellet's essay, published 1781, would surely have served to strengthen his convictions. Another similarity is that he takes the same view as de Gebelin and de Mellet of seeing the Hanged Man as turned the other way and as Prudence. Out of the Light a holy Word [logos] descended upon the watery substance, and I thought this Word the voice of Light, and unmingled fire leapt out of the watery substance [physis] and soared upward. The fire was quick and violent, and the air, being light, followed the Breath [pneuma] as it rose from earth and water to the fire, so that the Breath seemed suspended from the fire. But the earth and water remained intermingled and the earth could not be seen apart from the water. The watery substance of Nature received the Word and made itself into an orderly world from its diverse elements, and a brood of living creatures came forth. All of this is reminiscent both of de Mellet and Genesis. To an extent it might even be depicted in Etteilla’s cards, although I see there no fire leaping out of the clouds, just the contrast between the light space and dark clouds (card 1, 1789) and the living creatures in the air, on the ground, and in a primordial sea (card 7, 1789, as in the Grimaud card at http://www.tarot.com/tarot/decks/ind...kID=9&cardID=3, which is faithful as far as the picture but not the bottom keyword). Before going on, I need to point out that I made an addition to my previous post around 7:15 Pacific Daylight Time on March 29. I hope ayone who read my post before that will go back and look at it. Now I would like to move on to examine other versions of Etteilla I. In Kaplan vol. 2, there are four such (pp. 402, 400, 403, 409). I will call them Etteilla Ia, Ib, Ic, and Id respectively. The reason why the pages are not consecutive is that Kaplan misdates a couple I am following Dummett et al’s convincing chronology. They don’t say much about these decks’ individual features; but for me, each serves as a kind of commentary on Etteilla’s original effort of 1789. The first, my Etteilla Ia, is that identified by Kaplan as German and mid-19th century. It is actually from 1793, accompanying a book published in that year (Decker et al p. 113). Kaplan says it resembles the “Lismon,” which is Etteilla II. Decker et al disagree, and I concur. Temperance, Prudence, Maladie, and the 10 of Coins are all characteristically Etteilla I; Lismon would have Temperance with an elephant instead of two jugs; Prudence holding her staff up proudly instead of bending down to look at the snake; a more Aaron-looking Magician facing left; and a 1+3+3+3 pattern for the 10 instead of the 1+2+3+4. They are engraved and hand-painted, Decker et al say (p. 113), and not “printed by lithography and hand-painted” as Kaplan reports (vol. 2 p. 401). This deck is very similar to the 1789. The astrological signs are all there, and all seven days of creation designated on cards 2-8, in the same style as in 1789, except that on card 2 instead of “3 Crea.” we have “3 schoepfungstag,” day of creation, abbreviated to “schoepfung” thereafter. Likewise all four elements are designated in script with the abbreviation “Elem.” or “El.”; the script is hard to make out. I presume that it is merely copying the 1789 in this writing, although I haven’t seen all the relevant 1789 cards. And as Decker et al point out, on the first eight cards the lettering on the bottom is right-side-up, when it is usually upside-down. 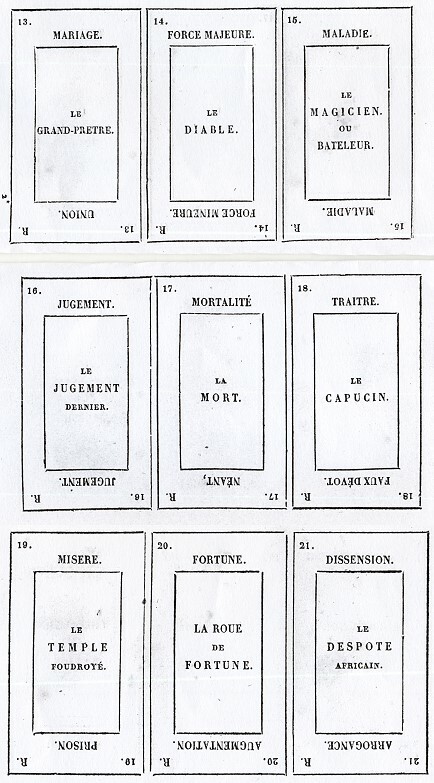 It still seems to me that the designer, here as in 1789, is associating these Etteilla cards with particular Marseille cards in their capacity as “signs of death.” I have already discussed this point in detail in my previous post (and anyone who read it before 7:15 pm PDT on March 29, please read my addition). Another innovation of this deck is that the words are not always even free translations of Etteilla’s keywords. In 7, instead of Protection we have Increase, “Vermebrung.” But nothing like that word appears in the lists of synonyms for that card; I think he took it from another card, I forget which [added later: it is from 20, Fortune], where it is called "Augmentation." Perhaps here it reflects something about the day of creation on which fish and birds are created: propagation of the species. Or it comes from the Marseille card associated with it, the Emperor, whose benevolent rule leads to increased prosperity. In 9, Justice, instead of merely repeating the German “Gerichtigkeit,” the deck has for the reversed “Die Obrigkeit,” Government. This comes from the synonyms (both versions) which have “Legislation,” “Lois” (laws), “Codes,” etc. In 10, Temperance, we see "Die Geistlichkeit, Spirit, as the reversed instead of the German for “Pretre,” priest. In the synonyms,” we have “Religion” and “Sect” (both versions), which perhaps can be generalized to "Spirit." In 16, the words are “Gericht,” Judgment, and “Meinung,” Opinion. In Etteilla, it is simply "Judgment" twice. In this case, the contrast between good and dubious judgment is in the list of synonyms, which includes “weak mind” and “pusaliminity” in the reverseds. It is clearer in the c. 1838 “Julia Orsini” list (presumably from the Dictionnaire than it is in Papus’s (presumably from D’Odoucet): the c. 1838 has “Injustice,” “Demence,” and “Betise”: injustice, madness, beastliness, none of which is in Papus’s list. In 24 reversed, instead of one word, comparable to “Desunion,” there are three: Trennung, Zank, Hass: Separation, Quarreling, Hatred. All are in the synonym lists. Decker et al speculate that the designer of this deck was Hisler, Etteilla’s Prussian disciple. If so, he would likely have had the Dictionnaire with him for reference. Even then he did not follow it precisely. But his modifications do not detract from the overall spirit of Etteilla’s perspective. Hi everyone, this is a fascinating thread! I adore all Etteilla decks. You have certainly spent a very long time in research and thought to compose all your detailed posts, a very big thank you from me. It certainly made me pull out all my Etteilla decks and Kaplan's encyclopedia. This business with the "extra" numbers on cards 13 to 17 is a puzzle though. In Kaplan they only seem to appear on a deck he refers to as a "German Etteilla Tarot, mid-nineteenth centuary" (p.401 and illus p.402), but I have recently obtained an old hand-coloured Etteilla deck with French titles that has these exact double numberings too. It also has the meanings at the bottom of the first 12 cards (except#7) printed upright, just as in Kaplan's German example. But then, both my copies of what I believe to be Grimaud Grand Etteillas (tax stamped 1890), have that additional 16 on card #15, but no additional numbers on cards 13, 14, 16, or, 17. My 1970's Grimaud Grand Etteilla has no aditional numbers at all. Is it really a "Grand Etteilla"? (a title which I thought only refered to Etteilla I decks) I see that #10, Temperance, has an elephant and a woman with a bridle; and #15, the Magician, is facing left; both images being identical to Lismon's Etteilla II deck from the mid to late 19th C. rather than from the "end of XVIII" as you state. Are these possibly the cards mentioned in Kaplan vol.II p.405 with sub-title "Etteilla Prints, late nineteenth centuary", and illustrated on p.406? ...unfortunately one card is missing, #26 the 10 of Carreau/Batons, but as there is no tax stamp I have always wondered just how old it might be, other than prior to 1890, the ubiquitous stamp on so many "old" decks. The cards actually clearly show many other differences from both supposed Etteilla I and subsequent Lismon decks, and it is this fact alone that rivets my attention, let alone what anybody ever wrote about the interpretation or "meaning" of the blessed cards! As someone stated earlier in this thread, there are "hack" writers, and I now believe there are also "hack" printers. What about my blue-bordered 1890-stamped Lismon Temperance, which has actually been printed with the title "Temperature"! Hmmm... I'm having trouble attaching images damn it!